Today we are saying a huge thank you to our wonderful Kassa whose beautiful energy, neverending enthusiasm for sharing art, creative ideas and inspirations have always been so contagious and it was a true privilege to be having her on the Team! Hi there lovelies, I'm here today sharing my last Finn Creative Team post, can you believe how fast this year has gone, WoW! Anyways just got to say a few thank yous before moving on to today's post, it's been an honour to be part of this team, Anna and Andrew you are the BEST, I feel truly blessed to have been part of your Finn Creative Team Family this past year. Right onto today's post, what can I say, I've indulged my love for color and my 'haPPy art'. I had a journal that was full of color but the cover that was bare so I have merged many layers with techniques I love, using the yummiest of Finnabair products I love so much. I gave the journal cover a coat of Clear Gesso and when dry, I roughly painted a few coats of White Gesso in and around the middle of the cover, leaving the edges with the bare kraft color peeping through. 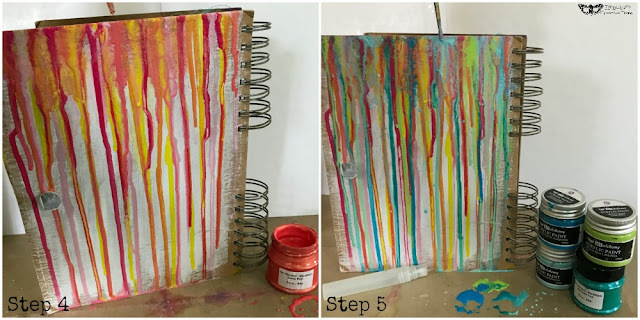 After a quick blast with the heat gun, I turned the journal upside down ready to add drips with the watered down Metallique paints. The knack for drippy drips is to stand the journal upside down journal, put the paint loaded paintbrush on the edge of the cover and just let the paint drip down the page. Then I quickly applied more colors using the same technique. For the longer drips I simply apply more paint to existing small drips. 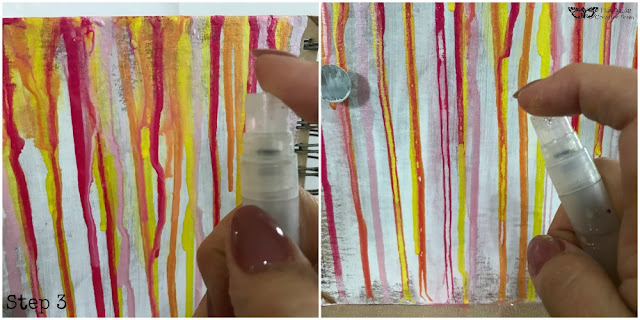 You can coax drips into the gaps by gently steering drips into the gaps with your paintbrush. Before the paint dried, I quickly spritzed a little water in and around the top densely dripped area - this allows the paints to merge and produces a soft finish. When the lower half of the cover's drips have nearly dried, I spritzed them too. If you spritz in closely, the paint from the middle of the drips lifts and leaves these cool stripey drips! If like me you want to add another color or top up with more of the previous colors, simply apply the same techniques when the cover is dry. A quick blast with the heat gun and the cool blues and greens can be applied. I apply less of these so as not to cover the lower layers and I leave the light patina color for my last drips as it leaves a soft top layer of color and it's one of my favourites too. Again I spritzed with water, the top drip area first followed by the lower half when nearly dry. 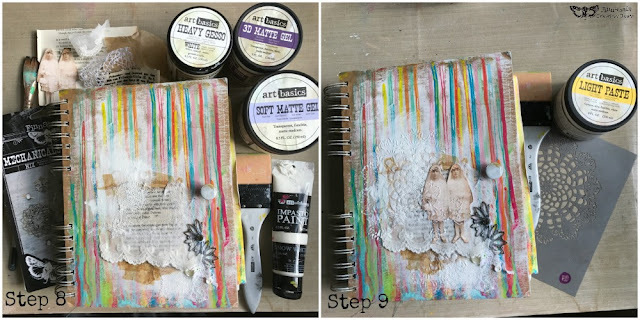 While the paints were out, I applied thick random daubs to my non stick craft matt and left to dry naturally - they make great acrylic skins to merge into your backgrounds when you peel them from the craft sheet. 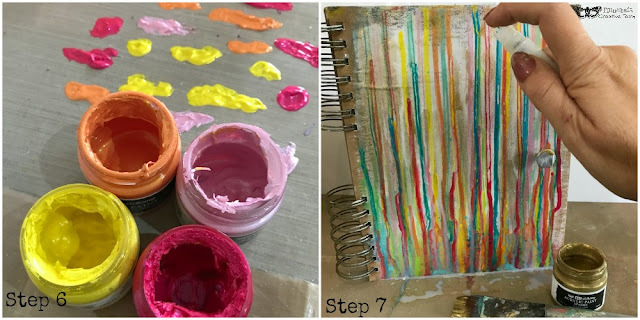 I turned my journal the right way up and spritzed gently with water and quickly applied watered down Dragon's Eye Sparks acrylic paint and again quickly spritzed with water. Using a mix of Soft Matte Gel (for the lighter paper layers/thin laces) and 3D Matte Gel for the heavier pieces (Mechanicals/buttons/heavy laces), I started to build layers of lovely texture to stand the girly Ephemera paper dolls I have trimmed out. 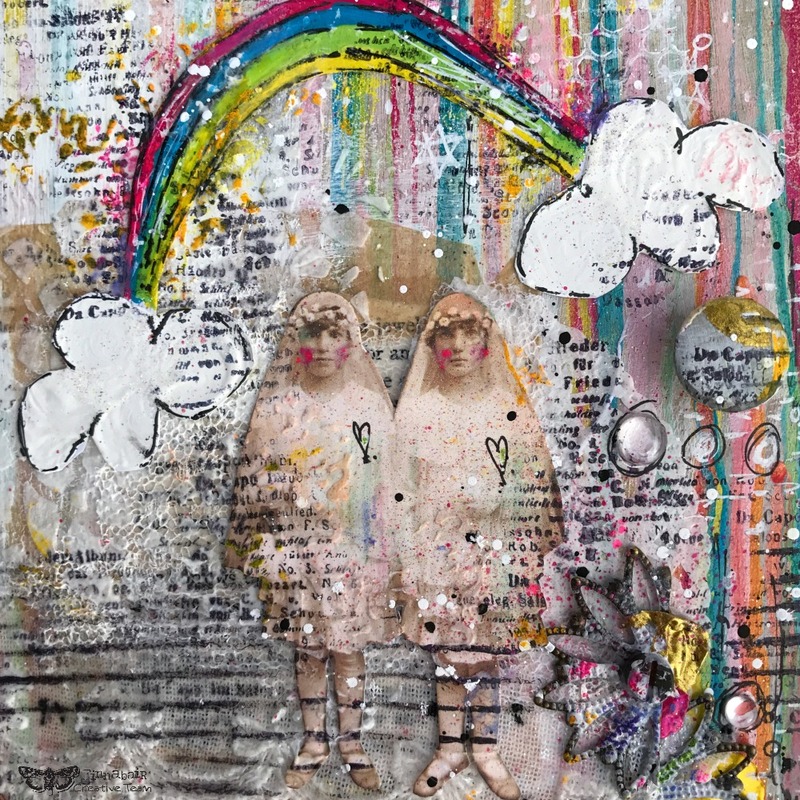 The beauty of using these gels with Ephemera is that you can carefully peel back previous layers which have not dried and slide more layers in as you go - this helps build with balance. Just stand back and see where you need more or even less as you can also take bits away. I cut in half the Mechanical Snowflake and slid in offset over on the right hand side which helped to ground my background. The pretty Doily stencils - I don't know where I'd be without them. :) Using them with any of the pastes helps to soften any page and here they toned down the rough edges of my ephemera layers. I took the Light Paste and repeated the stencil's pattern on the girls image which made them gently blend into my background and created simple dimension. On a piece of thin watercolor paper I doodled a rainbow, just a basic shape to paint as I wanted the bright colors of the paint to be the main focal point not the doodle itself. The rainbow was simple enough to paint, I just remembered to dry each bow before painting the next one. It doesn't matter if it's a bit wonky as a black water resistant fine liner pen doodled between the lines can sort that out. 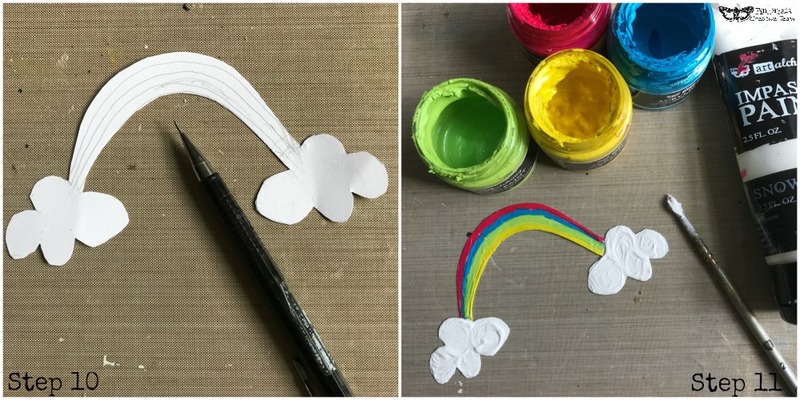 Snow White Impasto paint was perfect for the clouds, I just used a little extra paint on them and swirled my paintbrush around to make pretty cloud like patterns, sprinkled with Glitter before they dried for a little magical sparkle. Finally, it was time for all those little things that pull it all together and make your page dance. 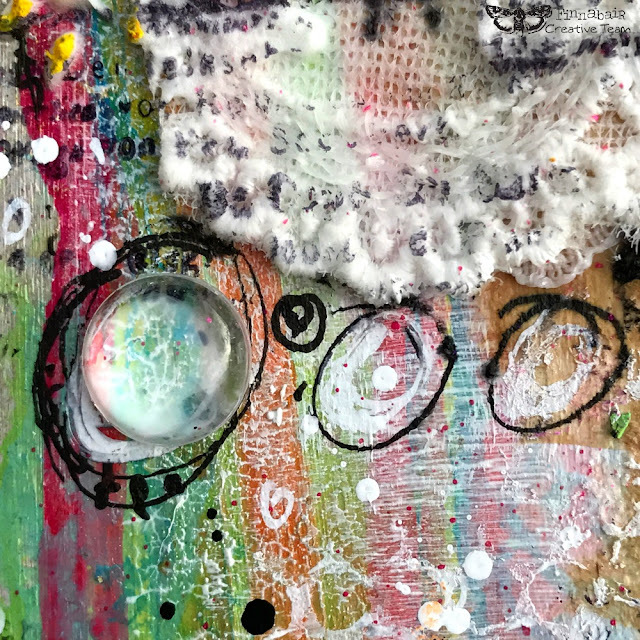 As my Ephemera was still not dry, I could peel back corners and push some of the acrylic skins between the layers with a little extra Soft Gel to secure them. I concentrated these around the bottom of my ephemera to give weight and ground my background, I wanted the upper half to stay light and airy. The rainbow was adhered so I could stamp over it too. I used black ink and inked up my stamps only partially thus giving the image a random edge - it results in a softer stamping effect and prettily melts the images into the background. I also used the Snow White Impasto paint to stamp with - this paint is so dense with color and with the paint being that thick the stamped images are crisp, clear and stand out which is rare with white paint! I also incorporated the round fastener knob as a part of my page. I doodled circles randomly here and there and in 3 of the circles I adhered the Melange Art Pebbles with Soft Gel. Once the gel dries, you can see through the clear Pebbles and spy your art beneath which is rather a cool detail. 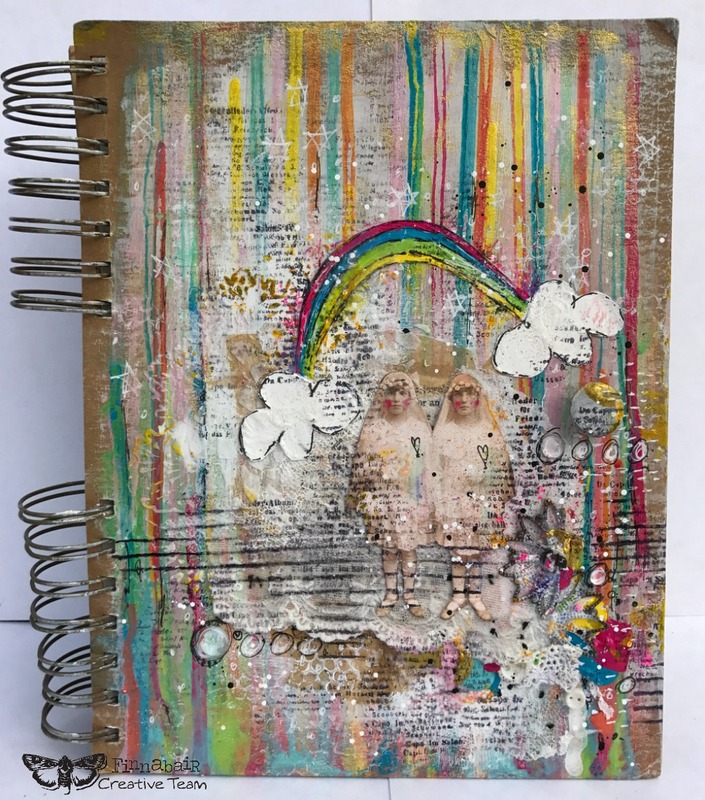 A final few scribbles, dots, dashes, stars with white and a touch of black journal pens, a scribble with the oil pastels to top up and add a little extra color (don't forget to pop a little color on your girlies cheeks, looks adorable!). Then some splatters with watered down black and white paint tah dah - finished! A haPPy, magical journal cover that I can stand out in my craftroom which will make me smile every time it catches my eye! I have so enjoyed sharing my 'haPPy art' and my various tips and techniques, I am a strong believer in sharing ideas, techniques, imagination, love and happiness! I have loved seeing your art this past year! THIS is just absolutely GORGEOUS! 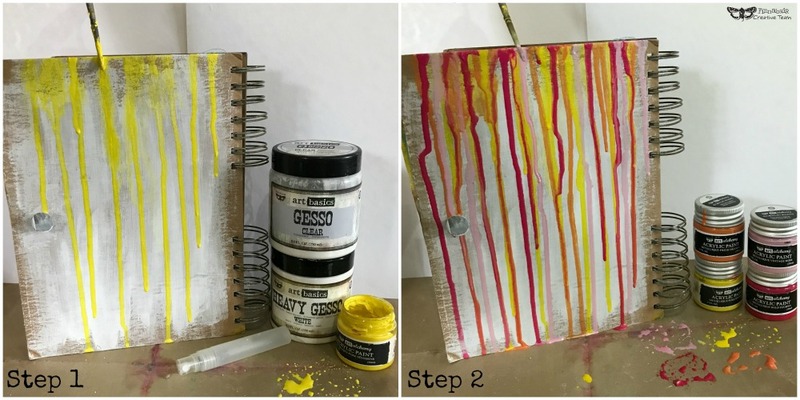 LOVE the bright colors and the lines you created with the drips! So many Fabulous details! 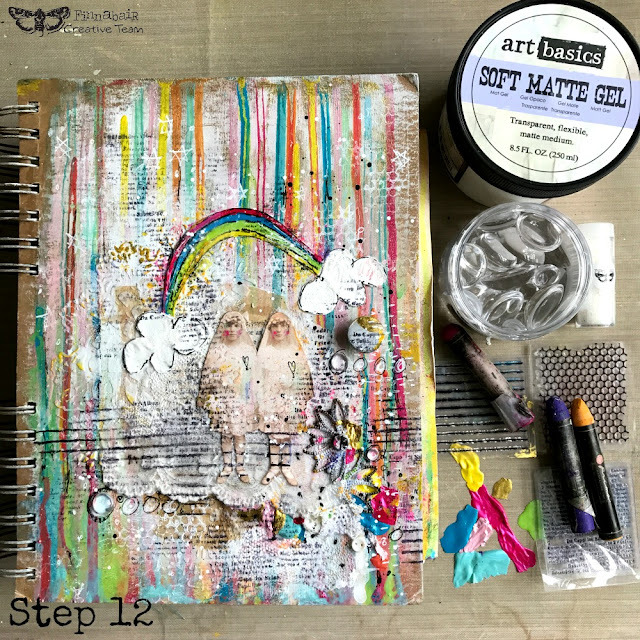 I have loved watching your process on the blog...thanks so much! !